The Old Hotel Market is located in the city of Elko New Market just off Interstate 35 in the southern Twin Cities Metropolitan Area. Over the last decade, the City of Elko New Market has been the fastest growing city in Minnesota. The Old Hotel Market at one time actually was a hotel. The two story brick building was built by Joesph Baltes is 1897 and was named the Home Hotel and BarRoom. The Bar Room was located on ground floor along with living quarters for the owners. Main floor has what was the bar room and six additional rooms. Up the double wide staircase were nine hotel rooms which still have the the original room numbers on the doors. Currently we have nine rooms open to the public including the Tinkers Stôr. Each room has its own theme which we are constantly changing. 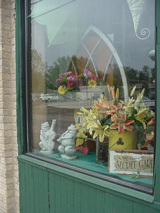 In summer months we open up the back yard to sell garden items and decor. The building is listed on the National Registry of Historic Places. Take a drive to experience some local history and great shopping. It is worth a trip just to see the original metal ceiling. It was during the early years of Scott County settlement that the former City of New Market began to develop into a community. German and Prussian emigrants first established the area known as Jackson (later the name would change to New Market), and by 1865, it was incorporated into a City whose social and civic activities were centered around the German Catholic Church. The incorporated area of the City initially included 320 acres, with only 6 blocks (approximately 17 acres) being developed before 1898. By the late 1870s, the City included a post office, general stores, and several other businesses. A hotel was built in the 1890s. The City also had its own public school, which was closed in 1916, when the private parish school was opened. New Market was booming by the turn of the century, due in some part to the grain elevator and train station located in nearby Elko, which brought business activities into the area. By 1944, the City of New Market had grown to include approximately 50 acres of developed land; an area which included only 15% of the City’s incorporated limits. Interstate 35 was constructed in the late 1960s, which provided an entirely different mode of transportation into and out of the community. While a general store remained in operation until 1970, the advent of better transportation corresponded with the dwindling of business activity in New Market. Automobiles provided an easy method of transportation to larger shopping centers to the north. Even with the decline of businesses, construction of residential dwellings began to grow in the 1960s and 1970s. A moratorium on building due to lack of sewer capacity in the early 1980s halted virtually any new construction for a period of approximately five years. After cooperatively building a sewer system at the headwaters of the Vermillion River located in New Market Township with the neighboring City of Elko in 1987, construction of housing again began to rise by the end of the 1990s. Between 1990 and 2002, 330 single-family homes were built. Of this construction, 98% occurred after 1998. As new housing construction boomed, the 320 acres of land initially incorporated as the City of New Market filled. Between 1997 and 2003, a period of only 6 years, the developed area of the City of New Market expanded by nearly 50% to include approximately 790 acres. This is compared to a rate of growth (developed area) of 66% for the first 46 years of the City’s existence.